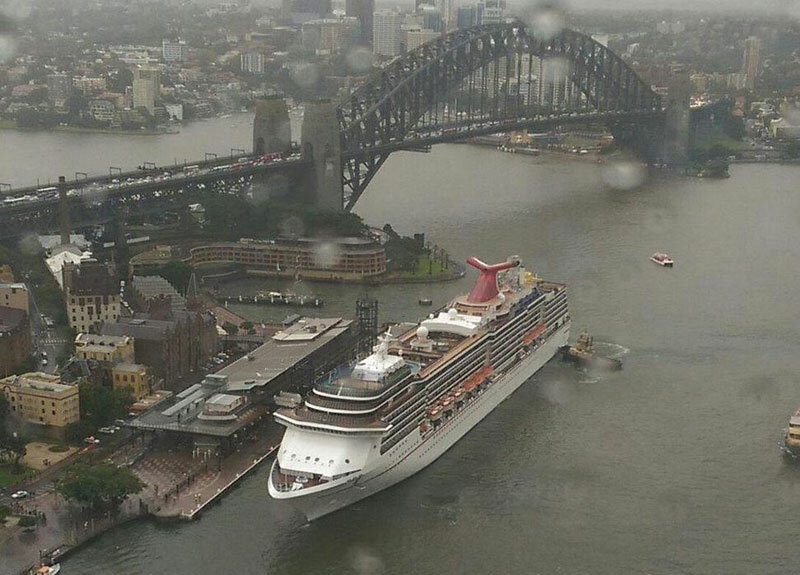 The Carnival Spirit has now docked back at its homeport of Sydney, Australia after a brutal storm kept the ship stranded at sea. The Spirit class cruise ship had been stranded at sea due to the Sydney harbour Authorities closing the port on April 21st. A brutal storm caused mayhem across New South Wales which also caused some damage to the Carnival Spirit but Carnival have stated that it’s minor and everyone onboard were safe during the time at sea. We have some good news this morning, Carnival have been notified that the port in Sydney is now open to ship traffic and we’re happy to say the weather has improved to allow safe entry into the port. The Pilot is now on board and ship is proceeding to the terminal and is expected to be alongside no later than 10:00 AM. Because we will be busy saying good-bye to guests from the previous cruise, we ask that you proceed to the cruise terminal 1.5 hours after your previously confirmed check-in window. Boarding is expected to commence at 2:30 PM and we plan to set sail at 7:00 PM. As we mentioned yesterday, we now plan on operating a modified 7-day itinerary visiting Isle de Pines from 9:00 AM to 5:00 PM and Noumea from 8:00 AM to 5:00 PM. I’m sorry to say we will not able to visit Mare. Sail with us (and we hope you will) and receive a one day refund of your cruise fare. Additionally, we will post a 50.00 AUD per person onboard credit on your Sail & Sign account for your enjoyment. If you choose to cancel, please contact our Special Services desk at 1300 385 625 and we will process a full refund within 3 weeks. Once again, we’re very sorry for this delay and thank you for your understanding. The good news is that this morning the Sydney Port is now open for operations and the harbor pilot boarded the Carnival Spirit to bring it safely into the port. At around 10 AM local time the cruise ship docked at the Overseas Passenger Terminal in Circular Quay. boarding for the next cruise is expected to begin at 2:30 PM with the Spirit setting sail at around 7 PM. As a result of the delay the next voyage has been modified to a 7-day itinerary visiting Isle de Pines from 9:00 AM to 5:00 PM and Noumea from 8:00 AM to 5:00 PM. I’m sorry to say we will not able to visit Mare. Carnival Cruise Line will give all guests a one day refund of the cruise fare along with a 50.00 AUD onboard credit on passenger Sail and Sign accounts.